The Sea-Dweller is Rolex's professional diving watch. It can survive depths of over 1,000 m (3,281 ft) and has a helium escape valve to equalize pressure. However, this extremely robust watch is also a great everyday watch for use on land. With its 1,220 m (122 bar, 4,000 ft) water resistance, the Sea-Dweller is one of the most robust Rolex watches. This diving watch is even suitable for professional saturation diving thanks to its helium escape valve. The Sea-Dweller Deepsea is even more impressive. It is water resistant to 3,900 m (390 bar, 12,795 ft) and, at 44 mm, is the largest Rolex available. The 43-mm ref. 126600 from 2017 is in particularly high demand. Developed in celebration of the Sea-Dweller's 50th anniversary, it features a red "Sea-Dweller" inscription and a Cyclops lens – a first for this series. This reference number is commonly known as "Single Red" due to its single-line red inscription. The Sea-Dweller was first introduced in 1967 as the next evolution of the Submariner that had been released 14 years prior. The first prototypes from before 1967 are extremely rare today, making them both very expensive and highly coveted by collectors. 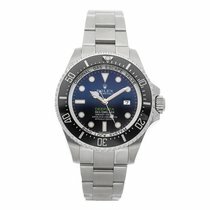 The Rolex Sea-Dweller is by and large a classic diving watch with a unidirectional bezel and luminous indices and hands. The cases of the current models are made of 904L stainless steel, which contains more nickel and molybdenum than typical stainless steel. In the world of metallurgy, 904L stainless steel is prized for its toughness and resistance to corrosion. How much is a Rolex Sea-Dweller? A mint-condition 2017 Rolex Sea-Dweller ref. 126600 costs about 14,700 USD. Since this diving watch is highly sought-after, the online price is about 1,900 USD above the official list price. However, purchasing online comes with the advantage of avoiding the long wait times often experienced with offline retailers. The introduction of the ref. 126600 marked the end of the production of the first Sea-Dweller 4000 with the reference number 116600, which was first released in 2014. A never-worn model that cost less than 9,900 USD in 2017, now costs around 13,200 USD. Pre-owned pieces are slightly less expensive at 12,400 USD. If you bought a ref. 116600 in the last few years, you can now look forward to a significant increase in value. Even the Rolex Sea-Dweller ref. 16600 has gained in value in recent years. This watch was produced from 1988 to 2008 and was replaced by the Deepsea. In the last five years, prices have risen by about 1,200 USD for pre-owned examples and by almost 2,500 USD for never-worn ones. Today, you have to set aside around 11,400 USD for a mint-condition timepiece and almost 7,800 USD for a pre-owned one. What do the prices for a Rolex Sea-Dweller look like? At 44 mm, Rolex Sea-Dweller Deepsea is the largest watch made by the Geneva-based manufacturer. Models with the reference number 116660 and a black dial cost almost 12,700 USD in mint condition and 10,300 USD pre-owned. Online prices are a few hundred USD less than those at offline retailers, though almost every Rolex has fantastic value retention. 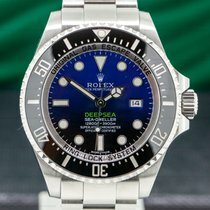 Among the most popular Sea-Dweller models, you will find the Deepsea D-Blue or "Deepsea Blue" introduced in 2014. This special edition includes a black and blue gradient dial and was released in honor of James Cameron's dive into the Mariana Trench in 2012. A Sea-Dweller Deepsea Challenge was on board for the dive and is capable of withstanding depths of 12,000 m (39370 ft). The Deepsea D-Blue is water resistant to 3,900 m (390 bar, 12,795 ft), just like its sister model with a black dial. This timepiece goes for about 14,700 USD in mint condition and around 14,000 USD pre-owned. How much does a vintage Sea-Dweller cost? Early reference numbers from the 1960s and 1970s are, without a doubt, some of the most highly coveted vintage versions of the Rolex Sea-Dweller. The ref. 1665 "Double Red" with its red "Sea-Dweller Submariner 2000" inscription on two lines is in particularly high demand and, of course, quite rare. Prices for pre-owned models sit around 28,700 USD and have continued to rise over the last few years. The so-called "Great White" has the same reference number, but no red inscription. The words "Sea-Dweller 2000ft=610m" were added to its dial in 1977. There are a few exceptions, but the "Great White" is generally less expensive than the "Double Red". You can find pieces in very good condition for under 24,700 USD. The "Great White" was also the last Sea-Dweller to feature plexiglass. Rolex first introduced sapphire glass to the ref. 16660, also known as the "Triple 6". They originally sold it alongside the ref. 1665. With a water resistance of 1,200 m (122 bar, 4,000 ft), it was twice as pressure-resistant as its predecessor, though it was also thicker. The caliber 3035, with a higher balance frequency and instantaneous date, replaced the 1575 as the movement. You can purchase a pre-owned "Triple 6" for as little as 9,800 USD. All Sea-Dweller models feature a date display at three o'clock. The standard versions have a stainless steel bracelet, a unidirectional rotating bezel with white markings, and a black dial with fluorescent white dot and line indices. The white hands are also fluorescent. The hour hand is a so-called Mercedes hand, a traditional Rolex characteristic informally named for the three-pointed star near the end of the hand. In the dark, the hands glow blue, as they're filled with Chromalight. Similar to the 904L stainless steel, Rolex is unique in their use of Chromalight; most other diving watches use the green-glowing Superluminova. In 2008, the Deepsea replaced the original Sea-Dweller. However, the old inscription remained in addition to the new Deepsea inscription, as consistency is one of the most important principles in Rolex's philosophy. Size is the first thing you notice about the Deepsea, as it's an impressive 44 mm in diameter. Until the Deepsea was introduced, the largest Sea-Dweller was only 40 mm. The Deepsea can also go to impressive depths: It's water-resistant to 390 bar , meaning it can go down 3,900 m (12,795 ft) beneath the ocean's surface. In comparison, most watches for recreational divers are only water resistant to 200 m (656 ft). Intricate construction is required for a watch to function and be water resistant at 3,900 m (12,795 ft). The Deepsea features a Triplock screw-down crown, and its sapphire glass is 5 mm thick. The titanium alloy case back is screwed onto the Monobloc middle case. 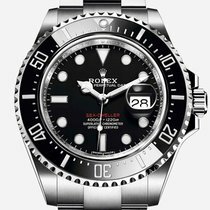 The Rolex Sea-Dweller offers a special technical extra that's necessary for long dives underwater: a helium escape valve. When divers stay for days or weeks in diving chambers, they must breathe special air saturated with helium. Tiny helium molecules find their way into the watch, and later, as the diver rises to the surface, the molecules cannot escape fast enough. This creates excess pressure in the watch and can cause the glass to pop out. To prevent this, Rolex invented the helium escape valve, which equalizes pressure. In the Deepsea and Sea-Dweller 4000, it operates automatically, while in some other diving watches, such as the Seamaster Planet Ocean from Omega, it requires hand operation. The second part of the Sea-Dweller 4000's name comes from the maximum depth it can reach – 4,000 feet, or 1,220 meters. The watch is perfect for ocean depths that are normally only reached by professional divers. The first Sea-Dweller was designed with this group in mind when it premiered in the 1960s. The automatic in-house caliber 3135 powers most Sea-Dweller models. One exception is the 43-mm "Single Red" from 2017, which uses the caliber 3235 with a 70-hour power reserve. Both movements feature an automatic date change with rapid setting. The central second hand can be stopped in order to set the watch to an exact reference time. As further proof of their accuracy, these movements are also COSC-certified. Every current Sea-Dweller watch has a ceramic bezel that can only be turned counterclockwise. This unidirectional bezel guarantees the dive time will never accidentally be increased. The markers and numerals on the bezel are all coated in platinum. The origins of the Rolex Sea-Dweller are closely tied to the company COMEX. The development of offshore oil drilling created new jobs for divers, who were needed to construct offshore platforms and pipelines. These jobs required the divers, as well as their watches, to dive deeper and deeper. The Compagnie maritime d'expertises (COMEX) has specialized in this sort of underwater mission since 1961. 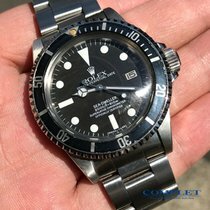 Rolex provided COMEX with a Submariner (reference number 5513), the first watch to feature a helium escape valve. This Submariner can be recognized by the inscription on its dial. These watches continue to sell for over 61,800 USD. Be prepared to pay six figures for rare Sea-Dweller prototypes without helium escape valves that were developed for depths of 1,500 m (4,900 ft). These watches were worn by a select group of U.S. Marine divers. Rolex introduced the Sea-Dweller in 1967. The watch premiered with three distinctive features: a helium escape valve, water resistance to 610 m (2000 ft), and availability on the consumer market. This was a new combination, however, the production run was still small. The watch can be identified by the reference number 1665. The model designation on the dial was red for the first few years, and is an important detail for collectors. The one or two-line red inscription was a feature until 1977. These watches earned a fitting nickname: "Single Red" and "Double Red." The year 1978 brought changes that went far beyond the red inscription on the dial becoming white. The caliber 3035 replaced the 1575 caliber. The number of alternations increased with the new movement, going from 19,800 to 28,800 A/h, which also improved precision. The watch's water resistance improved as well, raising from 610 to 1,220 m (4,000 ft). The next big change was in 2008 when the Deepsea replaced the Sea-Dweller. Six years later, the Sea-Dweller had its comeback as the Sea-Dweller 4000. Both the Deepsea and the Sea-Dweller 4000 are successors to the Submariner, which premiered in 1953. Newer versions of the Submariner are water resistant to 30 bar (300 m, 984 ft) and can be used during most underwater activities. Thus, the Submariner is an alternative to these two watches if you're looking for something different, but still want a Rolex. The Sea-Dweller 4000 and the Submariner both have 40-mm cases and look similar at first glance. However, there is one important distinguishing feature: The Submariner, powered by the same 3135 caliber, features a Cyclops lens in order to magnify the date display. Rolex offers a special Deepsea model with a blue and black gradient dial, the so-called D-Blue dial. The watch is a celebration of filmmaker James Cameron's (Titanic) journey down to the Challenger Deep on March 26th, 2012. The Challenger Deep is 10,908 m (35,787 ft) below the ocean's surface in the Mariana Trench. Cameron took along a special Rolex Deepsea Challenge, which was fixed to the outside of the submarine.